If you’ve read our article “How Processed Foods Impact Your Gut Health” then you know just how bad sugar is for you. The sweet stuff many of us crave is linked to poor gut health, inflammation, heart disease, diabetes, obesity, tooth decay and the list continues. Even if you’re health conscious and avoid foods such as donuts, cakes and cookies, chances are you’re consuming more added sugar than you even realize. Have you ever checked the ingredient label on sauces, condiments and crackers? You may be surprised to find out that they all have added sugars! 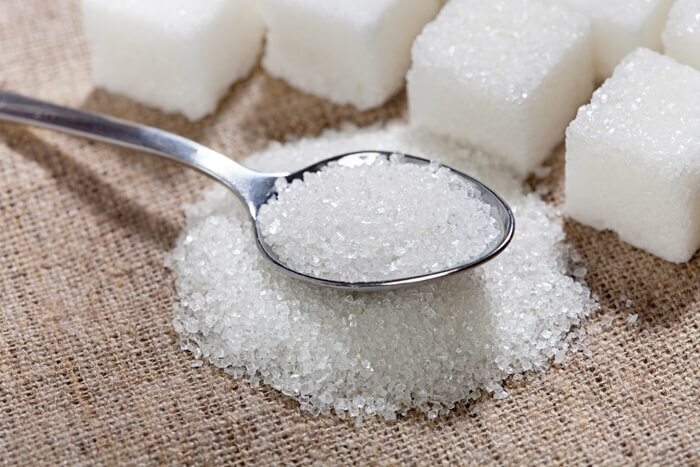 By definition, added sugars are sugars and syrups that are added to foods and beverages during the preparation process. They do not have nutrients that the body needs and only contain extra calories. It’s important to note that when I talk about added sugars, I’m not referring to naturally occurring sugars, which are found in fruits, vegetables and milk. You don’t need to worry about cutting natural sugars from your diet. Although, I’m not saying it’s healthy to sit and eat fruit all day either! How Much Added-Sugar Is Safe To Eat? According to the American Heart Association, the maximum amount of added sugar a man should eat per day is 37.5 grams (9 teaspoons); no more than 25 grams (6 teaspoons) per day for women. Below is an infographic highlighting 7 tips to cut added sugars from your diet.